This shop for Baked Cuban Sliders has been compensated by Collective Bias, Inc. and its advertiser. All opinions are mine alone. 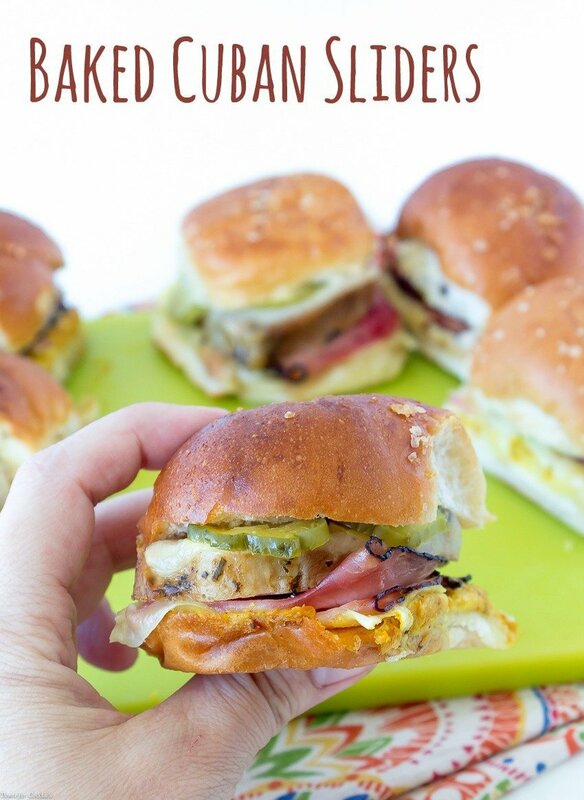 #RealFlavorRealFast #CollectiveBias Feed a crowd with these easy-to-make Baked Cuban Sliders. 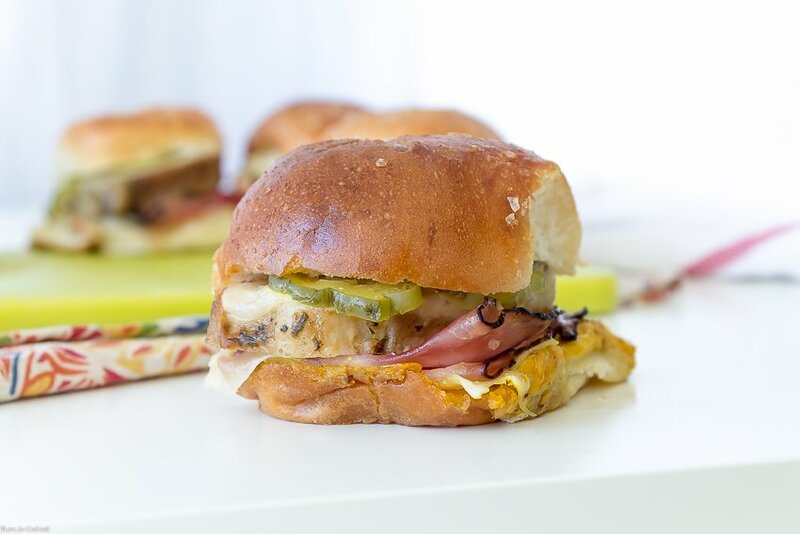 Soft dinner rolls layered with garlic herb pork loin, Black Forest ham and Provolone cheese then topped with tangy mustard and pickles. Brush with garlic butter and bake until golden brown. One of my all-time favorite sandwiches is a Cuban sandwich. There is just something about slow cooked pork that makes my taste buds sing. 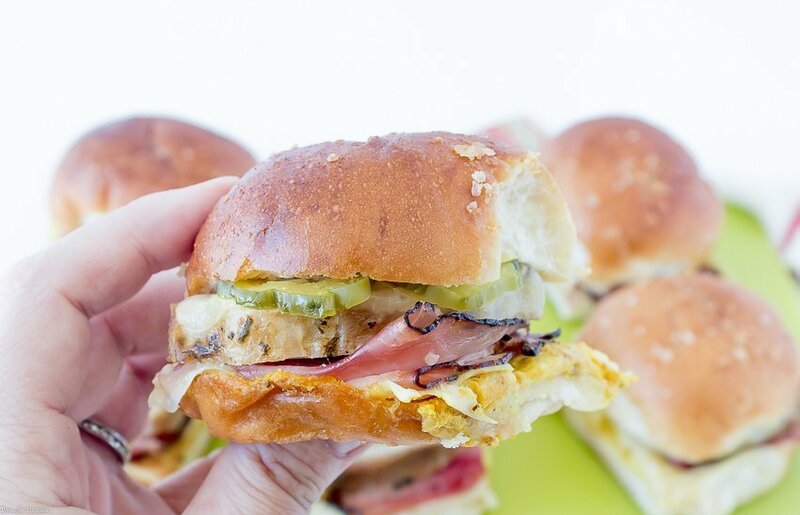 [bctt tweet=”Easy 30-Minute Baked Cuban Sliders #gameday #tailgate @snacks” username=”thyme4cocktails”] Add my favorite tangy sandwich toppings and this gal is in heaven! Whether it is game day or a busy weeknight, it is super easy to prepare your favorite Smithfield® Marinated Fresh Pork products from Walmart in your slow cooker for a flavor meal in no time. 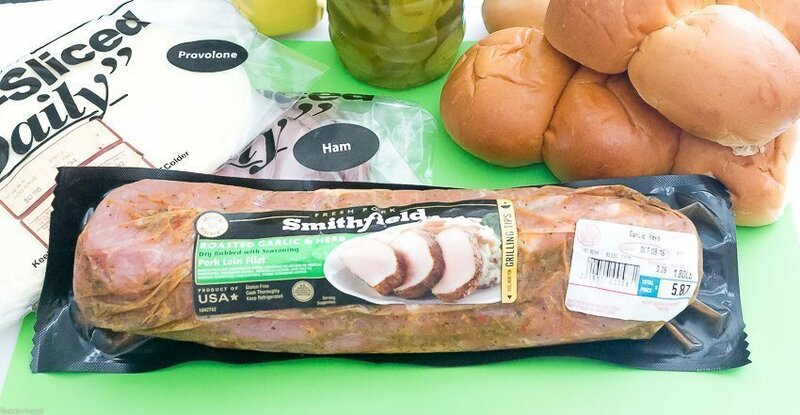 Smithfield® Marinated Fresh Pork products come in a ton of flavorful options so you can customize your Baked Cuban Sliders with anything from savory applewood smoked bacon to smoky mesquite pork. I used the Smithfield® Garlic & Herb Loin Filet for this recipe. 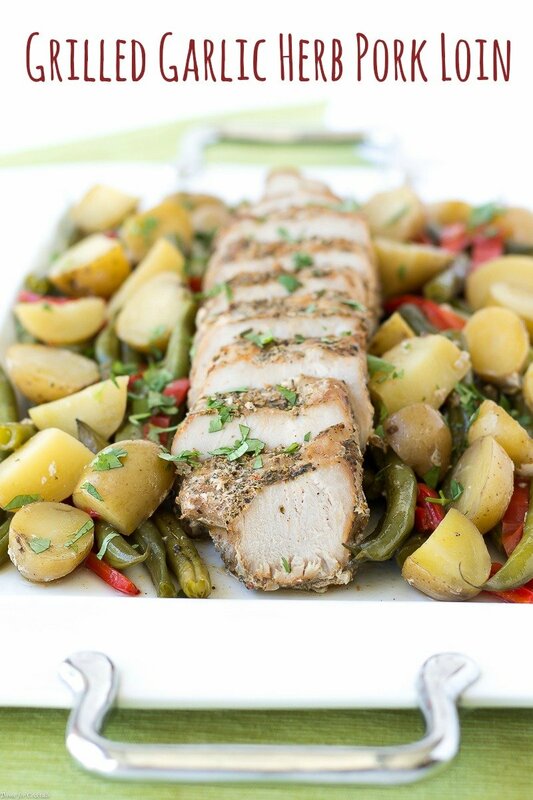 We loved it in my Grilled Garlic Herb Pork Loin with baby potatoes, fresh green beans and red bell peppers. It’s a great one-packet dinner you can make in the oven or on the grill. 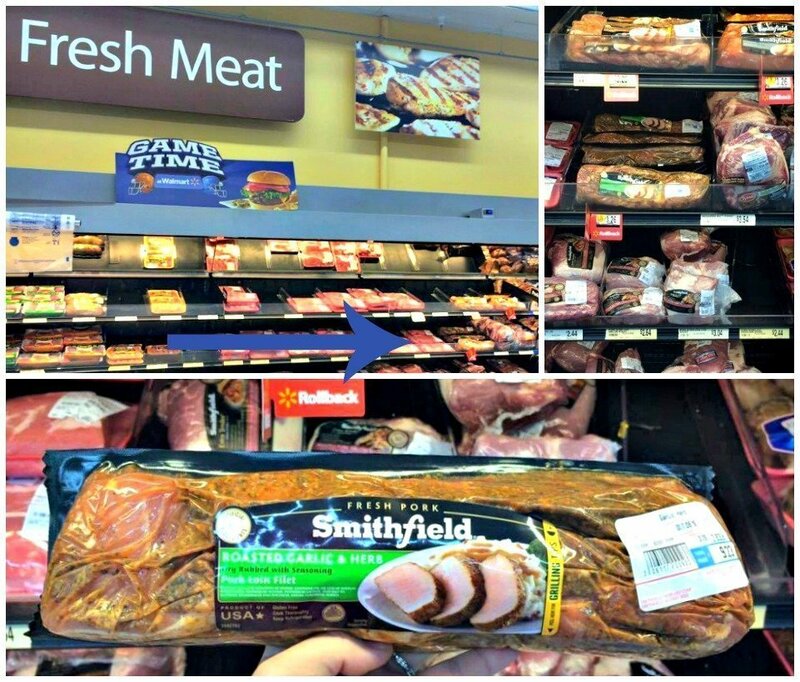 Be sure to click the coupon below for a $1 off your favorite Smithfield® Marinated Fresh Pork flavor. If you are feeding a crowd, one pork loin with make about 12-14 sandwiches. 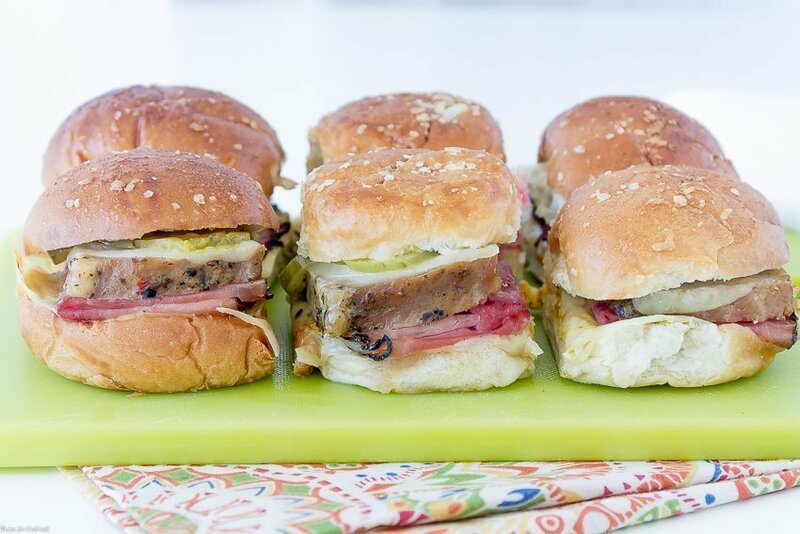 Since I made these Baked Cuban Sliders just for me and Paul, some went into the oven for dinner that night and another batch went into the fridge for the weekend. You can make these sandwiches up to a few days ahead of time or even freeze them for up to a month. Now about the layers… You can pretty much layer these sandwiches any way you want. I like to put cheese on top and bottom to keep everything stuck together! And when it comes to the mustard and pickles go with your faves. A mix of yellow and stone grain mustards rock my boat, along with basic hamburger dills. But it would equally rock with honey mustard and bread and butter pickles. Be sure to visit www.SmithfieldRealFlavorRealFast.com for more 30-minute recipe ideas. There’s also a contest to win free fresh marinated pork for a year! https://youtu.be/nal51gfamUY Paul likes these so much he couldn’t wait for me to finish taking pictures before he was snagged a bite of one! I started the pork loin in the slow cooker that morning, made the sandwiches in about 10 minutes later in the afternoon and had dinner on the table in 20 minutes that evening! 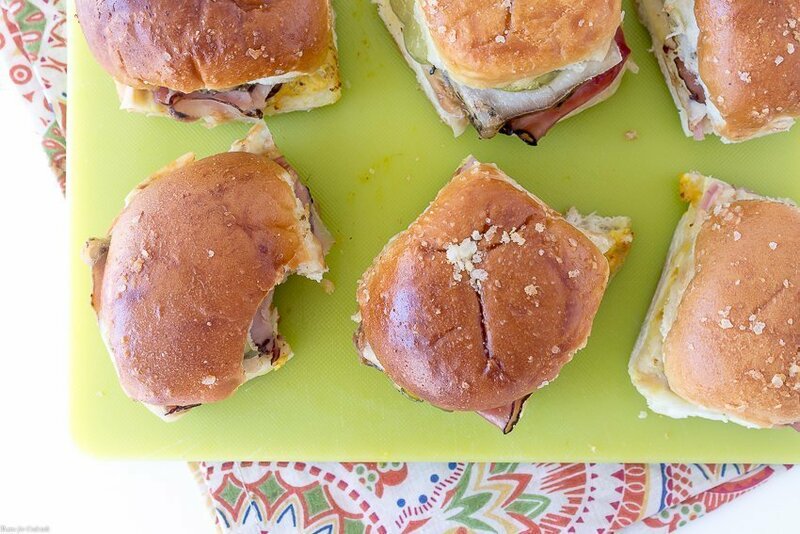 Feed a crowd with these easy-to-make Baked Cuban Sliders. 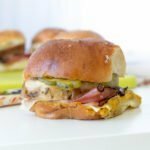 Soft dinner rolls layered with garlic herb pork loin, Black Forest ham and Provolone cheese then topped with tangy mustard and pickles. Brush with garlic butter and bake until golden brown. Prepare pork according to package directions, set aside to rest. While pork rests, preheat oven to 350 degrees. Spray a large cake pan or baking dish with non-stick spray. Cut rolls in half length-wise. Place bottoms in baking dish, set tops aside. Spread desired amount of mustard on bottom of rolls. Layer cheese, ham, pork and pickles in desired order. In a small bowl whisk together butter, garlic powder and salt. Brush over bun tops. Cover dish with foil, bake 15 minutes. Uncover and bake 5 minutes more. Cut sandwiches apart and serve hot. Sandwiches can be made up to 2 days in advance, store in foiled covered dish in refrigerator. Gracias David! We are making another batch today to share with friends during the game!